Ultrasun prescriptions are currently not available via our online consultation service. You can, however, request an online consultation for health aids for travel. What are Ultrasun products used for? Ultrasun sun protection products contain UV filters that protect the skin from sunburn, ageing and other harmful effects of UV rays. 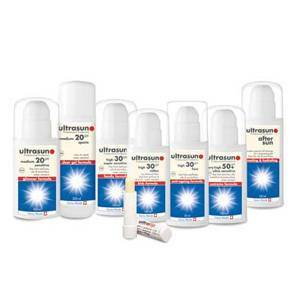 Ultrasun is a renowned Swiss brand offering a complete range of sunscreens for the whole family. Thanks to the hypoallergenic composition of the products, they are safe to use for people with even the most sensitive skin. All creams have a unique dosing pump to ensure a high level of sterility and long shelf life. Everyone knows by now how important it is to protect the skin from harmful effects of the sun. UV rays can cause premature ageing (wrinkles), pigmented patches and even skin cancer. Ultrasun products offer optimal protection under all circumstances - whether you are a winter sports enthusiast or sun worshipper on the beach. All products are very resistant to water and fragrance free (with the exception of after sun cream), and do not contain any emulsifiers, oil or other additives. In principle, Ultrasun products need just one application for all-day protection. Apply sunscreen 30 minutes before going outside to allow it to penetrate the skin and begin to work. Reapply regularly if the sun is hot or if you are exposed for several hours and after swimming. Children have very sensitive skin. It is therefore important to only use products with very high sun protection factor (SPF 30+), reapply often and use a sun hat. Dark skin (dark brown or black hair, dark eyes): SPF 10. Always use SPF 30 or higher for children, regardless of their skin tone. Do not use if you are allergic to any ingredients in Ultrasun. Check the label on the package for a list of ingredients.